Of all the risks that Marvel Studios have taken over the years, Guardians of the Galaxy remains the most impressive. I would have loved to have been witness to the pitch about making a major Hollywood blockbuster featuring a talking racoon and a sentient tree. It’s quite incredible that Marvel actually chose to go ahead with the film considering there were and still are many other, more well-known characters at their disposal. Guardians of the Galaxy tells the story of Peter Quill (Chris Pratt), a human who was abducted as a young boy and taken to live in Outer Space. Decades later, he forms an alliance with four other outcasts to fight a common enemy that threatens the galaxy. Films in the Marvel Cinematic Universe (MCU), with the exception of The Incredible Hulk, put an emphasis on fun. However, Guardians of the Galaxy is without a doubt the most fun out of all of them. James Gunn brings his signature directorial style to the cosmic side of the MCU which results in the best time that I have ever had at the cinema. One of the key factors that make the film such an enjoyable experience is the sheer brilliance of the characters and the performances of the cast that bring the characters to life. Chris Pratt was originally best known for paying the chubby, lovable goofball Andy Dwyer on Parks and Recreation and its safe to say he shocked the world when his buff physique was revealed in the trailers. He delivers a charismatic performance that bears resemblance to Harrison Ford’s performance as Han Solo in the Star Wars saga. 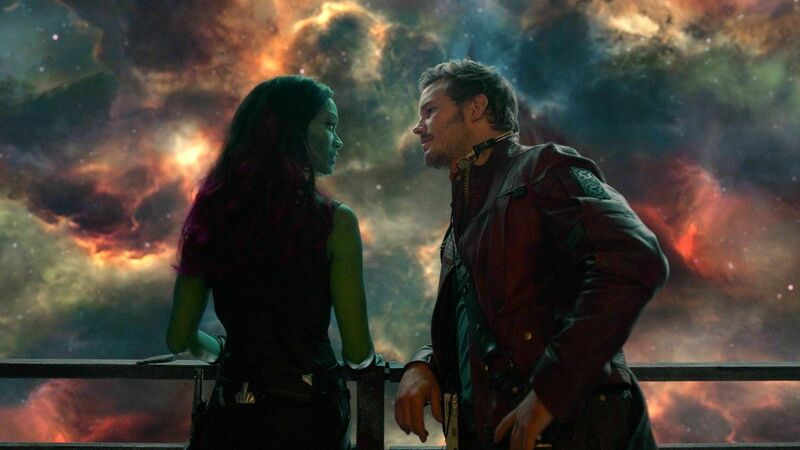 As for the rest of the Guardians, Zoe Saldana brings a scarred yet tender character in the form of Gamora to life, whilst Bradley Cooper and Vin Diesel absolutely nail their voice performances as Rocket and Groot respectively. The surprise package of the film is former wrestler turned actor, Dave Bautista as Drax. He proves himself capable of not only blending in with a cast of talented performers but actually steals the show with his pitch-perfect comedic delivery. The cast also includes fun performances from Benicio Del Toro, John C. Reilly, and Glenn Close, but the focus of the film is firmly on the Guardians and the development of their bond. The chemistry between the core cast is the reason why the film is so beloved by both die-hard Marvel fans and casual audiences alike. A common criticism of many MCU films revolves around the rather mixed CGI. However, with Guardians of the Galaxy, the CGI is outstanding. The worlds of Xandar and Knowhere are simply stunning. There is not a single frame that looks substandard to expectations that come with a $200 million budget. It is through the fantastic visuals and CGI that the world-building of the cosmic side of the MCU succeeds. Guardians of the Galaxy is also the funniest film within the MCU. Although some of the jokes lose their effectiveness after multiple viewings, the majority of the jokes still bring uproarious laughter. This is largely down to James Gunn’s direction and the comedic line delivery of the cast. The action in Guardians of the Galaxy is brilliant, with the third act, in particular, being particularly impressive. The film, while a huge risk itself, takes an even more significant risk with his final confrontation between the heroes and villains. Instead of the characters punching or shooting at each other, Peter Quill instead attempts to distract Ronan the Accuser (Lee Pace) by dancing in front of him and challenging him to a dance-off. This is something which would typically be a terrible decision, however, due to the film establishing Peter’s love of music, it is a decision which not only works but proves that James Gunn understands these characters. I can’t talk about the positives of Guardians of the Galaxy without bringing up the exceptional soundtrack. The music is as crucial to the film as the characters. In a way, the soundtrack is its own character. The songs selected by Gunn all play their part in shaping the tone of the film perfectly. Now I can’t hear of ‘Hooked on a Feeling‘, without thinking of the Guardians. That being said, the film is not perfect. It like most comic book films ever made has a serious villain problem. The film features three primary villains in the form of Ronan the Accuser, Nebula (Karen Gillan) and Korath the Pursuer (Djimon Hounsou). Ronan is very one-dimensional, whilst Nebula is under-written and Korath is given absolutely nothing to do. Additionally, Michael Rooker is extremely underused as the space pirate Yondu, something which, thankfully, the sequel, Guardians of the Galaxy Vol. 2, rectified. In the end, Guardians of the Galaxy is an outstanding film, especially considering the fact that prior to the revelation of any footage, the film was widely expected to be Marvel’s first flop, both with audiences and critics. Propelled by the action-star-making performance of Chris Pratt, and his chemistry with the rest of the cast, the film is easily one of the MCU’s strongest outings to date.